ACTIVE PATTERN: A warm front is now north of Alabama, and the day should be warmer with most communities enjoying a high in the 60s this afternoon. Colder air over East Alabama thanks to the cold air damming (CAD) effect) will be scoured out later in the day. The sky will be mostly cloudy, and showers during the day should be few and far between. Rain moves into the state late tonight, mainly after midnight, and will continue through tomorrow morning ahead of a surface cold front. Some thunder is possible, but SPC has removed the “marginal risk” of severe storms due to the lack of instability. The main window for rain is from roughly 2:00 a.m. until 2:00 p.m., and rain amounts of around 1/2 inch are likely. We start the day tomorrow with temperatures in the 60s, then falling into the 50s during the afternoon. MORE RAIN: Rain returns to the state Thursday night into Friday morning; at this point it looks like the main window for rain comes from about midnight Thursday night to 12:00 noon Friday. Thunder is possible, but no severe storms are expected. And, rain amounts of around 1/2 inch are likely. Temperatures will fall back into the 50s Friday afternoon. 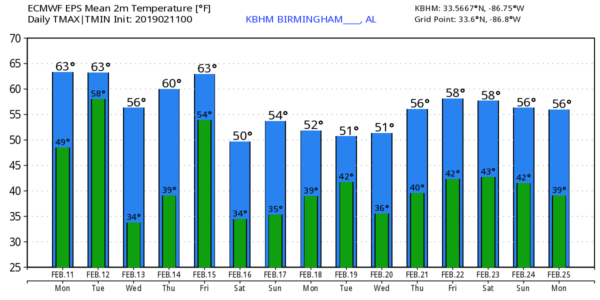 THE ALABAMA WEEKEND: Saturday will be dry with a good supply of sunshine; the low early Saturday morning will be close to the freezing mark, but we then rise into the mid 50s by afternoon. Clouds increase Sunday, and a few showers could return by afternoon… Sunday’s high will be in the mid 50s as well. NEXT WEEK: The active pattern continues… we will have a risk of showers at the beginning of the week, and more rain is likely a few days later as the wave train continues. No sign of any excessively cold air for the next seven to 10 days… see the Weather Xtreme video for maps, graphics, and more details. ON THIS DATE IN 1983: A major snowstorm impacted the Mid-Atlantic region and southern New England. Snowfall up to 25 inches fell at Allentown, Pennsylvania. Snow amounts of 35 inches occurred in parts of the Blue Ridge Mountains of West Virginia at Glen Cary. Windsor Locks, Connecticut recorded a record 19 inches in 12 hours. A ship sunk off the Virginia/Maryland coast killing 33. I have a weather program this morning at Grantswood Community School… look for the next Weather Xtreme video here by 4:00 this afternoon. Enjoy the day!